Symbiosis Entrance Test 2019: The Symbiosis International University is renowned for the variety of courses being best in its class. The university has different schools for imparting specialization in different courses; located in Noida and Pune. The Symbiosis Admission for most programs is through entrance test. Latest Update: Symbiosis Entrance Test 2019 Application Form Filling Procedure Starts from Today 24th January. 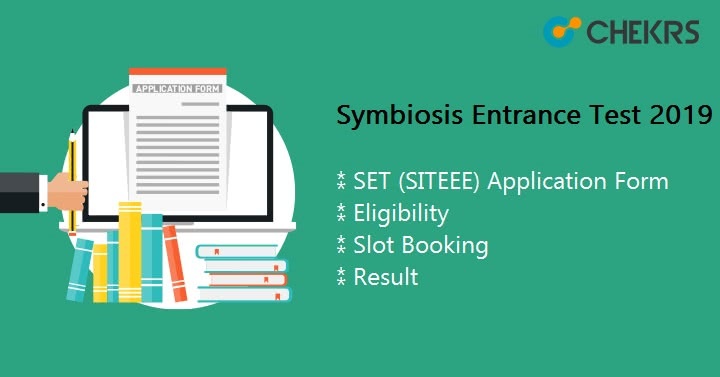 Latest Update: Symbiosis Entrance Test 2019 Notification With Complete Schedule Released! Check below. SIT is the name associated with the admission process in its Symbiosis Institute of Technology. SITEEE refers to the SIT Engineering Entrance Examination for admissions in B.Tech Courses. It is the SET (Engineering) which has been renamed as SITEEE since 2018. The SIT also provide admission to students through JEE Mains conducted at the national level and MHT CET. If you are looking to get more information related to the exam on eligibility details, how to apply, Symbiosis Important Dates, exam pattern, syllabus, and result; then keep reading the article to know more about the exam. Those who want Symbiosis B Tech Admission should know that the exam is purely drafted as per requirements in the full term program. Thus the university has certain eligibility criteria which are necessarily required to be filled by every applicant. If not, admit cards will not be provided to the applicants. Here is the description of acceptable Symbiosis B Tech Eligibility terms for participation. 1 10+2 passed from a recognized board with Physics and Mathematics as compulsory subjects along with one of the Chemistry/ Biotechnology/ Biology/ Technical Vocational subject. 2 Passed Diploma examination in appropriate branch of Engineering / Technology from an AICTE approved Institution. Those who are interested in pursuing the course of engineering have to fill up the Symbiosis B Tech Application Form. Also as the engineering exam is now separated from the common SET, acing updated information is vital to proceed. From home page click on the registration link and complete the process. Post registration, the application form will open up; fill in all the mandatory details as per instructions. Recheck the accuracy of information submitted in each field. The gateway of the fee will open up; finish off the process as per convenient method. The fees can also be paid in the form of Demand Draft made in favor of Symbiosis International University. Documents Required: Scanned latest color passport size photo, not old than 3months. Note: The online application form filling is not required for candidates who will take admission through other exams. In such case, one can directly approach the admission cell of respective institute. Those who expect their admission for sure need to be very attentive with the exam pattern. It is advisable to each applicant so that strategy can be implemented and one can easily complete paper in given time. Check out the Set Engineering Exam Pattern given below so that you can form the strategy to attempt and beat exam blues. Marking Scheme: No negative marking and 2 marks for each correct answer. The Symbiosis Entrance Test Syllabus will help out those students who haven’t appeared in any national exam prior. Though the base of each test is taken from up to 12th studies but somewhat differs in terms of raised difficulty. The SITEEE Syllabus 2019 will review all important topics of Physics, Chemistry and Mathematics. To make practice easier each day we besides Symbiosis Engineering Entrance Test Syllabus, helpful study material will also be provided to ensure each reader perform well. To appear in the most prominent phase of the selection process, admit card is the key. The SITEEE Hall Ticket can be accessed through the official website only. Those who have applied for multiple course exams can know details earliest by SITEEE Admit Card Download through the link shared here. Downloading admit card on time will help all to reach exam center as per exam schedule and avoid any inconvenience. Note: The candidates will have to carry the along colored format of admit cards and any one of the photo identity: Passport/ Driving license/ Voter ID card/ Pan card/ AADHAR card (UID)/ School/College ID Card. The result stating performance of each participant is illustrated through the scorecard released by the university. The candidates based on their scorecards will be given priority for admissions. The result will illustrate candidate’s name, roll number, sectional score and overall score. We will update all candidates about the Symbiosis Result Date. The scorecard can be viewed through the official website only using the login credentials. However, SIT EEE Result Download is made a bit simpler for all as through link shared by us, downloading it will be easier.